2015’s Star Wars Battlefront had the notoriety of being a game without content. 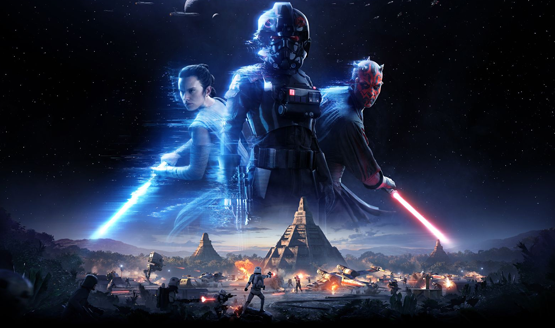 The missing campaign, lack of maps, and reliance on a paid season pass to add more were the front and center complaints levied against the reboot of a beloved Star Wars game series. 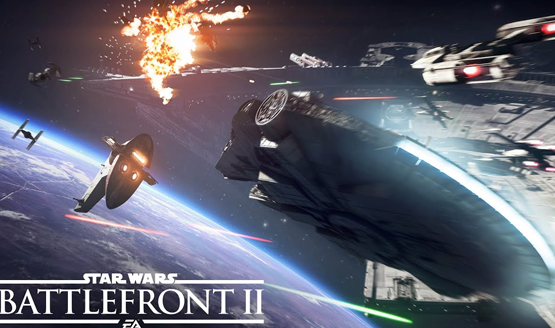 Star Wars Battlefront II has been a direct response to fan feedback, tackling each and every complaint that was brought up to make a game that is far more robust and content filled than the first. In addition, it now keeps all players together by offering free seasons of additional DLC content for everyone rather than paid add-ons, but that free content comes at a cost, as oxymoronic as that sounds. Battlefront II is a fun and vastly more full featured game than its predecessor, though it isn’t without its faults. I know that you’re waiting for me to talk about microtransactions, loot boxes, the progression economy, and how Battlefront II reeks of mobile pay-to-win schemes, and I’ll get there. I first have to give praise to the rest of the game. Outside the implementation of paid mechanics actually giving players an edge (and sometimes more than just an edge) in battle, Star Wars Battlefront II could have been one of my favorite games this year. The campaign is an exciting—if predictable—Star Wars adventure, Galactic Assaults capture that certain Star Wars feel, and Starfighter Assault is more addicting to play than it has any right to be. 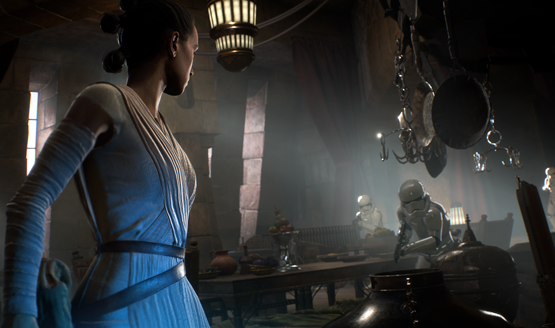 New to Battlefront II is a dedicated single-player narrative campaign. For all intents and purposes, the campaign is Star Wars Episode 6.5. Though it focuses on Iden Versio as an Imperial commander and what she goes through following the destruction of the second Death Star, her path crosses with many other familiar characters, occasionally providing a chance to play as them. I was expecting a lackluster side story that barely touched on the greater canon, but I was pleasantly surprised to find a compelling narrative arc, distinct characters, and a story that is wholly Star Wars through and through. One particular scene shows the exceptionally Nazi-like regime of the Empire from the inside and creates a pretty fascinating confrontation for the characters involved. It’s shortly following this scene that Iden Versio’s story treads the ground of predictability and things shift from the initially unique perspective on the Star Wars universe. Iden and the other members of Inferno Squad are far from two dimensional characters, and each interaction with well known players from the Star Wars canon usually feels like a meaningful moment rather than fan service. The central lore of the Skywalker saga is so central to the Battlefront II campaign that I would not be surprised to see elements seeded here that come to fruition in the Episode VIII and IX films. Despite being on the shorter side of shooter campaigns—taking me only five hours to run through on normal difficulty—the production values are impressive and show that the single-player was not a tacked on addition just to appease fans. It’s a legitimate piece of the Star Wars fiction, almost to a fault. It will also be further expanded through additional story chapters released free with future DLC content, yet another impressive piece of EA and DICE’s content release plans. The campaign’s gameplay doesn’t diverge too heavily from what makes the multiplayer gameplay so much fun, but it also doesn’t ever feel like it was just cobbled together from scraps and pieces of the multiplayer component. There’s a cohesion making the single-player feel like a part of the complete package while also being entirely its own thing. 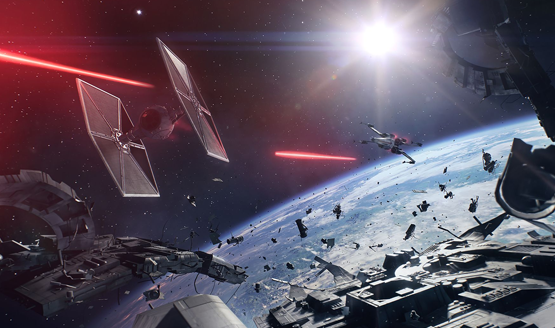 Single-player also extends to a series of battle scenarios in arcade mode, eight for the light side and eight for the dark side, each with three tiers of difficulty. These arcade scenarios mimic the multiplayer gameplay and provide an opportunity to get used to the combat and characters before taking them onto the live servers. Arcade mode is also where you can play splitscreen co-op and customized games, but it’s also where one of the mobile style tactics comes into play. Each Arcade scenario rewards players with 100 credits upon completion, but after 500 credits are earned, there’s a time lock before more can be earned from Arcade. Keep in mind that the game never warns you about this. It wasn’t until I completed my next battle scenario and was met with a screen saying, “Earn more credits in 14 hours,” that I realized any further Arcade play wouldn’t be rewarded. I understand that the lock is to prevent credit farming for loot boxes, but 500 credits is just 13% of the amount required for the most expensive loot crate, and less than 25% of the amount required for the cheapest one. For reference, multiplayer matches of Galactic Assault typically award me with between 300-400 on completion, depending upon my performance. Exploring the biggest battles in Star Wars history is the Galactic Assault mode, and does it ever feed that Star Wars fantasy. Everything from the art design of the levels and characters, the visual effects of explosions and blaster bolts, and the sound and music design create an experience that is simply playable Star Wars. The wealth of maps are varied, each just as fun and interesting as the last, and attacking or defending is a different experience on each, so it never gets boring. The four classes provide distinct gameplay styles that are a lot of fun to explore, especially as you begin to customize them using Star Cards, even if the progression system is a broken mess that rewards paying money and random drops over meaningful advancement with the character class. 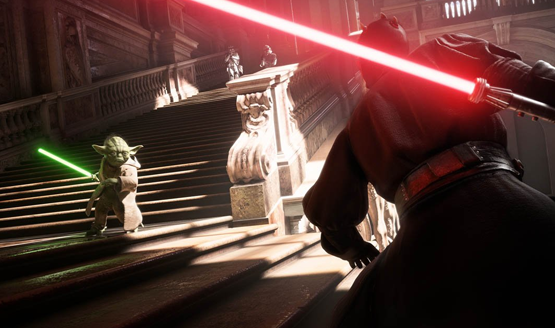 This objective based mode pits light side against dark side across the eras, with character models of each individual class fitting the respective time frame and environment that they are fighting in. The four main classes, along with some advanced classes, are portrayed differently depending on the map. If you’re on Kamino it will be battle droids against clone troopers and if you’re on Tattooine it’s a struggle between rebel forces and the might of the Empire’s seemingly endless stormtrooper army. It’s just another detail that makes every moment in Star Wars Battlefront II feel so authentic to the Star Wars experience. Heroes are the exception to this, so it’s possible to see Rey fighting in the Clone Wars era, and Yoda to appear in the modern trilogy battles. My personal kryptonite is the Starfighter Assault mode. The flying feels great to control, and the UI, while a little cluttered and intimidating at first, actually makes for an easy to navigate three dimensional space as well as making it easier to shoot enemies on the move. These huge maps are the equivalent of Galactic Assault in terms of attacking, defending, and multiple objectives that must be completed to win, only in the pilot’s seat instead of boots on the ground. Starfighter Assault manages to balance the inevitable chaos of Star Wars space battles with a player friendly design that means every scenario feels authentic and fun. It’s a theme that resonates through Star Wars Battlefront II—authenticity to the Star Wars fantasy. Each Galactic Assault and Starfighter Assault map is a camera left moment from across the Star Wars canon—that is, each is a battle that’s insinuated but never explicitly shown in detail. Battlefront II takes this opportunity to explore what might have taken place among the wreckage just following the Death Star II explosion, for example, or following the initial AT-AT walker assault on Hoth. Living up to its name, it excels in diving deeper into the Star Wars battlefronts, acting as a kind of supplementary material to the main stories being told about the heroes. These are the stories of the grunts. If all that isn’t enough (and trust me, it is), there’s also the Heroes vs. Villains mode that obviously pits a team of four heroes against a team of four villains; Strikes, which are essentially smaller Galactic Assault matches with singular objectives; and Blast, your basic team deathmatch. While I tended to spend most of my time in the much more intensive Assault modes—because they are just that good—each of these options just adds to and diversifies the content offering for just about any style of player wanting to live out the exciting Star Wars multiplayer fantasy. In spite of all that is good in Star Wars Battlefront II, there’s a Wampa Beast in the cantina that needs to be addressed. Let’s talk about progression and loot boxes. I’ll try to explain the convoluted currencies and multiplayer progression in the simplest way possible, but it’s still going to be a novel. First of all, Battlefront II has three currencies: Credits, Crystals, and Crafting Parts. Credits are earned through gameplay (and given when you get a duplicate from a loot crate), and Crystals are the monetized currency. Both can be earned in very limited amounts through milestones, and both are used to purchase loot boxes, which contain Star Cards and customization items for your heroes, troopers, and ships. Star Cards are modification options for the various units in the game, both changing and improving abilities. One card might give an ion turret that replaces the heavy trooper’s shield, and another might decrease the cooldown before health regeneration starts. Star Cards can be acquired randomly in loot crates, or bought directly using Crafting Parts, which are earned through loot crates and milestones. Crafting Parts are also used to upgrade Star Cards through their four rarity levels, from common to epic. To upgrade a Star Card, you must have increasing amounts of Crafting Parts, and be leveled to specific levels per rarity. One level requirement is general multiplayer account level, while the other is the Star Card level of the individual trooper class. Star Card level is simply determined by how many Star Cards you have for that particular class, not through usage, skill, or any kind of progression that actually requires using the class to advance. While epic rarity Star Cards cannot be earned in loot boxes, the first three tiers can, and there is no restriction to equipping them (unlike the upgrades being locked behind leveling and getting even more Star Cards). If I just so happen to get a rare level Improved Sentry Turret for my officer, I can equip that immediately, whether or not I’ve ever used the officer class. Otherwise I would need to actually craft Star Cards for the officer in order to level him up, then make sure my account was at level 15, and then hope I’ve got the 240 Crafting Parts still left over after all that to purchase the upgrade to the rare tier. Overall, it’s simply a bad and convoluted system. Progression is tied to a level of randomness and monetization, and in no way accounts for or rewards playing the game as specific classes. Gameplay is little more than a gate to being able to eventually earn enough of a currency to either roll the dice or craft Star Cards you need. The exception to the epic card restriction is the Elite Trooper Edition of the game, which immediately gives players a few epic level Star Cards like improved thermal grenades and improved shields. Anyone that decided to shell out more money has an objectively noticeable advantage without ever having played the game. And anyone that opts to continue paying money to roll the dice will be positioned to perform better in the various skirmishes and battles. This is about as close as it gets to a pay-to-win mechanic before you’re essentially no better off than poorly balanced free-to-play mobile titles. There is a shining beacon on the horizon. DICE has clearly been taking player feedback to heart. Star Wars Battlefront 2 is entirely a response to feedback and criticism from the first game. They were very open about making changes following the beta. And most recently, they made a rapid and drastic change to the cost of hero unlocks due to massive outcry. If there is the potential for saving grace, it is that the very foundations of Star Wars Battlefront II are made from responding to player feedback. If DICE continues with that culture, we’ll see Battlefront II shape and evolve into a better game. Given that future content will all be free for any owners of the game, that does need to be taken into account for the review of Battlefront 2. DICE is determined to never split the player-base due to paywalls on maps, modes, and characters. The first batch of DLC will be coming on December 5, with two new characters, a new Galactic Assault map, new Starfighter Assault map, and three new campaign missions, all free to players who own the game. And that’s just the start. It’s basically a progressive trickle of content once you buy it, similar to the Overwatch model. DICE needs to untangle monetization and progression, keeping any elements that give players an advantage in battle away from real world money. Progression should feel like a reward for playing the game, not paying the game. It’s disappointing that this conversation needs to surround such an amazing title. Star Wars Battlefront II is an insanely fun and full featured experience no matter which corner of the galaxy or era of the story you go to. The Star Wars authenticity can be felt throughout, but blatantly predatory microtransactions are a blight, force choking the life out of what is otherwise one of my favorite games this year. Star Wars Battlefront 2 review code provided by publisher. Version 1.02 reviewed on a standard PS4. Some multiplayer content played at a preview event provided by EA at their Redwood studio, but we spent a lot of time with the multiplayer on retail servers to verify connection, balance, and currency economies. For more information on review scores, please read our Review Policy.